This book is now available for online purchase here. The status of the rich avifauna of western North America is ever changing in response to human influences, geomorphic processes, and natural climatic variation. Documenting and synthesizing the patterns, rate, and causes of these changes is crucial for the conservation of birds in this region, particularly in a time of rapid climate change, expanding human population, and accelerated resource extraction. 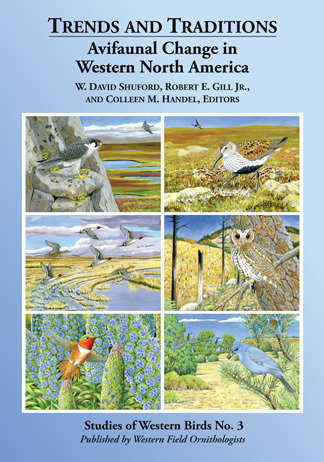 To that end, a symposium on avifaunal change was held at Western Field Ornithologists’ annual conference in San Diego, California, in October 2014, which formed the basis for the current volume. The papers herein emphasize the overarching themes of the effects of extensive habitat loss and degradation on the avifauna of the West in the 19th and 20th centuries and the responses of birds to environmental change and variation. Several papers portray rays of hope, documenting reversals of trends in the loss of some important habitats, the recovery of some avian populations in response to management, and resiliency in other species as they adapt to novel habitats. Others express increasing concern for the potential future effects of a rapidly changing climate. Most emphasize the importance of long-term monitoring of the population trends, distribution, and ecological attributes of the region’s birdlife. The geographical representation and bird species or groups covered varies widely. Collectively these papers should aid in the long-term conservation of the region’s birdlife. Hover over the image to see the other cover. © 2018, Western Field Ornithologists, All Rights Reserved.